Second Life Wrestling • VWE FRIDAY NIGHT EDGE (11.9.2018) SORRY, I WAS LAGGING! - KABALYERO - PLAY, BLOG & EARN! Home / second life / second life vwe wrestling / second life wrestling / virtual wrestling entertainment / vwe friday night edge / vwe lyra phoenix / vwe radiance championship / vwe wrestling / Second Life Wrestling • VWE FRIDAY NIGHT EDGE (11.9.2018) SORRY, I WAS LAGGING! Second Life Wrestling • VWE FRIDAY NIGHT EDGE (11.9.2018) SORRY, I WAS LAGGING! VWE Friday Night Edge is a free-to-watch Second Life Wrestling show / event presented by Virtual Wrestling Entertainment in Second Life. Visit http://www.vwewrestling.com to learn more about VWE. 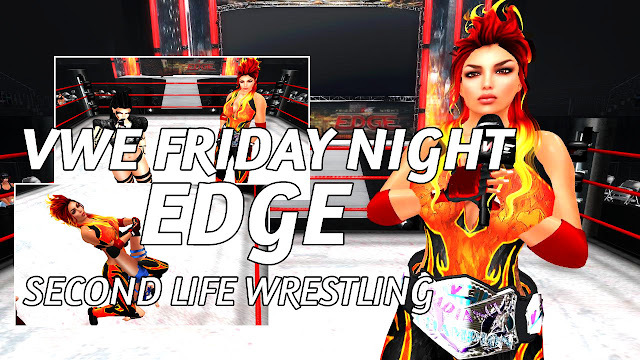 In this week's VWE Friday Night Edge, the show started with the reigning VWE Radiance Champion Lyra Phoenix and Ellie Embers. They entered the ring and talked to the crowd about the VWE Radiance Championship. They were followed by an appearance by former VWE Radiance Champion Rani Patel and Brooke Owens. The encounter between the two group of ladies turned into a VWE Radiance Championship Match between reigning and defending VWE Radiance Champion Lyra Phoenix and Challenger Brook Owens. The next match was a Tag Team Match but I was not able to cover it because my viewer was performing very, very badly. Anyway, tune in next week for another coverage of VWE Friday Night EDGE right here in this channel, In Second Life.